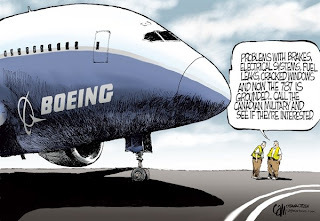 When the FAA has approved the 787 fix and Boeing's action is focused in the return-to-service as soon as possible, it is interesting to know that behind the batteries issue there have been other topics that have been tested by Boeing to correct (or improve) the lack of maturity for some systems. Boeing's 787 could be back in service as early as next month after the FAA has approved the package of battery modifications the manufacturer devised. In this video Boeing shows how they are managing the retrofit campaign that involves 300 employees and parts-kits for the 50 aircraft grounded. 10 teams have been deployed in the customers´ facilities in Japan, Qatar, Chile and the U.S, in parallel to the installation of the changes on the new planes at 2 787 FALs, in order to resume soon deliveries. The approval from the Japanese Civil Aviation Bureau (JCAB) is pending. Boeing is also using the 787 downtime to develop, test and certify a series of other systems improvements to areas that proved troublesome during the aircraft's initial service period. 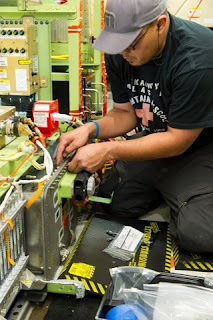 The work included testing a revised power panel design, an improved engine anti-ice system and upgrades to the back-up standby instrument displays and crew information system (CIS), a Honeywell-developed aircraft health-monitoring feature that forms part of the 787's central maintenance computer. Ground tests of new software for the aircraft's power electronics cooling system (PECS) were also undertaken. The PECS dissipates the heat created by the large, high-voltage motor controllers that condition the variable-frequency power generated by the engines and auxiliary power unit (APU) for use by aircraft systems. Although portions of the large motor power system are energized by the APU battery, the changes are related to the overall electrical system upgrades rather than being associated with the battery modification. The power panel was the source of early in-service issues with the 787, at least one of which on an ANA aircraft in April was traced to a short circuit in one of the units. Power panel malfunctions were also behind a string of events in December that triggered error messages indicating failures of the aircraft's starter-generators. Based on the article “Keeping Busy” published in Aviation Week.